If you’re like me and lack the patience and precision to brew your own beer (or at least to do it well), that doesn’t mean you can’t mess around with the flavor of your brews, thanks to Randall Jr., a neat vessel created by Dogfish Head that lets you add interesting ingredients into a beer and see what happens. 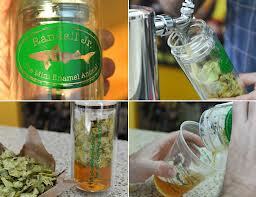 Randall Jr. gets its name from the larger, more complex beer infusion contraption that Dogfish Head has dubbed “Randall the Enamel Animal,” which is used in brewpubs around the world to infuse beer with extra flavor, usually additional hops. Randall Jr. boasts a simpler design for home use. It looks like a clear travel mug, but one with a double-decker lid. There’s a wire mesh that screws on top of the clear plastic cup, straining whatever is poured out of it, and a green cap that screws on top of the mesh, sealing the contents for freshness. Simply place the ingredients you wish to infuse into your beer – be they hot peppers, fruit, herbs or candy – and then fill the chamber with beer, screw on the lid, and place it in the fridge for 20 minutes.